There are four important questions to answer about elections. Is there a special danger? Is there a major war or economic crisis to consider? Is the election important to the oppressed nationality movements combating racism? Is there a political option independent from the Republican or Democratic Parties (which both represent different interests of the 1%)? Answering these questions can help guide groups of people looking for the best outcome from the elections, although the real change our world needs will come from the people’s movements and not the ballot box. The rich and powerful will never let us simply vote their whole rotten system out, but we can strike blows against them, win important fights and build our righteous causes. Activists in every part of the country should analyze their own conditions and determine the best course of action. Elections are often about finding contradictions in the political system of the rich and powerful and highlighting them in order to win battles, raise political consciousness, or build involvement. Progressive people will have opportunities this November to weaken Trump’s power by turning over Congress (getting a non-Republican majority). The fewer friends Trump has in the House and Senate, the better. Often this will mean voting against Republicans. The amount of time and effort movements should spend getting people to vote will vary depending on the particular electoral contest. A few races throughout the country will see progressive candidates mount strong campaigns. Some states, like Minnesota, Illinois and Wisconsin, will have the opportunity to defeat major anti-labor politicians at the ballot. It’s very important for the labor movement to stop politicians who are looking to further damage trade unions by spreading ‘right to work’ legislation and other backward policies, like ending the right of public employees to collectively bargain. In some of these battlegrounds, it might be necessary to spend time and effort making sure that the worst enemy of the working class loses. At the end of November, no matter the outcome, there will still be a world a world to win for those willing to fight for it. 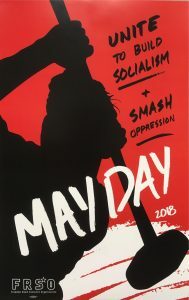 Organizers should work to win the important battles at the ballot box while remembering that real hope is in the people’s struggle and change is won in the streets, neighborhoods and workplaces – whenever we fight greedy bosses, organize to stop police crimes, protest on campus, and elevate the political understanding of everyone around us. We teach best with our actions (and people learn best by doing) so organizers must fight all the harder through November and beyond for a society that values people over profits. Fight to stop police terror – justice for Michael Brown!